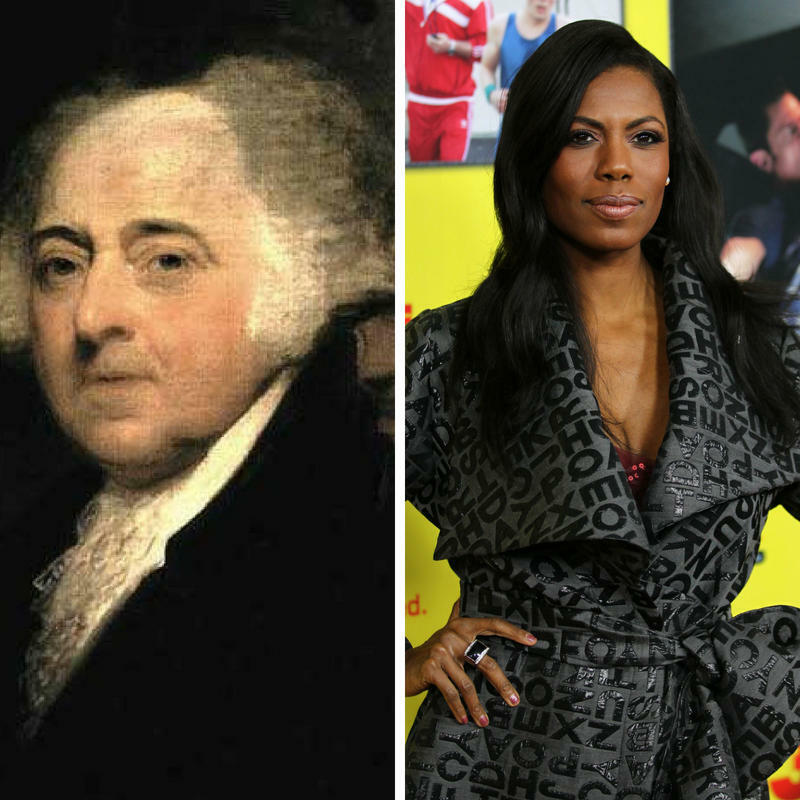 Vice President John Adams and former Trump White House aide Omarosa Manigault-Newman were both topics during Vice President Mike Pence's recent visit to Cincinnati. Yesterday's event at the Westin Hotel with Pence was billed as a chance for Trump's guy to tout the Trump tax cuts before a crowd that had been convinced long ago that the tax cuts were the greatest thing since sliced bread. It was also about the host organization, America First Policies, touting Ohio Republicans in Congress who are running for re-election – like congressmen Steve Chabot and Brad Wenstrup – and U.S. Rep. Jim Renacci, who has taken on the daunting task of knocking off a sitting Democratic U.S. Senator, Sherrod Brown. America First Policies gave Chabot, who is in one of the toughest races of his 22-year career in Congress, the high privilege and pleasure of introducing Pence to the crowd. Chabot and Pence are old pals, having served together in the House for 10 years. Pence, Chabot said, is the greatest vice president since John Adams. Now, Adams was the first vice president, under George Washington, and Pence the 48th, under Donald Trump. That leaves 46 other intervening Veeps who were apparently hamburger meat in the eyes of Steve Chabot. We're not certain if Chabot is aware of Adams' opinion of the vice presidency. It is, Adams said, the most insignificant office that ever the invention of man contrived or his imagination conceived. Yes, Mr. Adams, but the perks are nice. Just about every major campaign these days has an enormous electronic email list of supporters and frequent donors to whom they blast appeals for money on a regular basis. Tuesday afternoon, one came into email inboxes from the gubernatorial campaign of Democrat Richard Cordray and his running mate, former congresswoman Betty Sutton. Written under Sutton's name (who knows who actually wrote it), Sutton was in quite a lather and in high dudgeon over the fact that, in Cincinnati, Pence held a private fundraiser for Cordray's Republican opponent, Mike DeWine. Or, as the email put it, "rubbing elbows with Mike DeWine and a bunch of mega-donors." "You can bet Pence will smear Rich at the high-dollar fundraiser by using the same nasty attacks we hear from the Republican Governors Association,'' the email said. Well, maybe the assembled "mega-donors" did hear such attacks – not that it would make much difference because (a) the event was closed to the media and (b) the people in the room hardly needed convincing that Mike DeWine should be the next governor of Ohio. Later, in the open-press Pence speech in the ballroom, DeWine was a ghost. He was not seen. It's unlikely he was in the building; the fundraisng event was at the Queen City Club. Pence did not mention him once to the 400 Trump supporters in the audience. Neither did any of the GOP officeholders who held a short "panel discussion" on the Trump tax cuts before Pence spoke. Not Sen. Rob Portman, nor Chabot, nor Wenstrup, nor Renacci. We can think of only two reasons why DeWine was playing the part of the Invisible Man during the public part of Tuesday's show. The first is that DeWine is walking a fine line – he wants the votes of Trump Republicans, but he doesn't want to stick too close to either Trump or Trump's Ohio nemesis, Gov. John Kasich. He wants to be his own man. The second is about the sponsor of the event, America First Policies. This event – one of 16 the group has held in cities all over the country so far this year – is about promoting Republican incumbents who have been loyal to the Trump agenda and keeping the GOP in control of Congress in November's mid-term election. And the organization operates a "dark money" Super PAC that will spend millions around the country this year to keep a GOP majority in place that is decidedly pro-Trump. They really weren't that interested in DeWine and his race. No one really expected Pence to bring up the subject of Omarosa Manigault-Newman in a speech in which his appointed task was to tout the Trump tax cuts. But that darned media just couldn’t leave it alone. 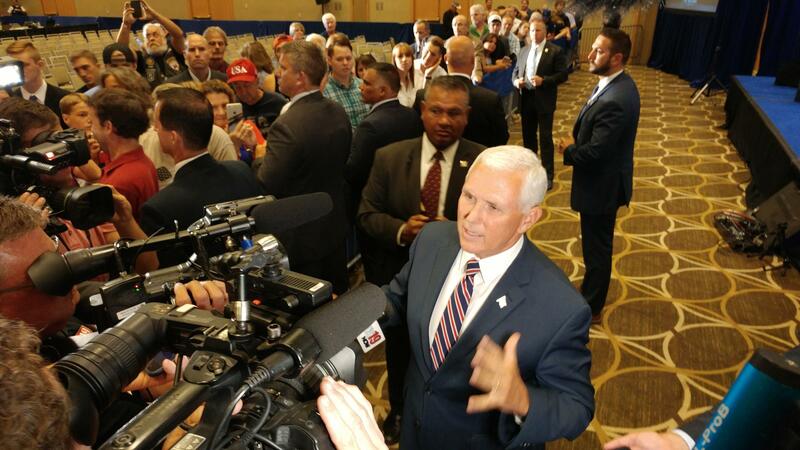 Vice President Mike Pence takes questions from reporters during Tuesday's visit to Cincinnati. After his speech, dozens of his fans crowded around the rope line in front of the stage to shake the vice president's hand and give him a word or two of encouragement. Of course, a knot of Secret Service agents hung close to Pence as he met the public. Near the end of Pence's speech, White House and America First Priorities press aides herded the media, photographers, videographers and print scribblers at the end of the rope line so that Pence could stop briefly to answer a few questions. Once he made it down to the media gaggle, the second question shouted out was, How about this Omarosa thing? Manigault-Newman is a former Trump aide and co-star with Trump on The Apprentice who is publishing a book making many allegations against Trump and saying he is unfit to be president. Trump's been tweeting about her, calling her a "crazy, crying lowlife" and a "dog." She was fired from her White House job in December. Pence really didn't want any part of this. "Honestly, my focus is completely on the progress we're making. We fully support the decision that was made regarding the employee." A couple more shouted questions from the gaggle and Pence, Secret Service in tow, ducked behind a black curtain, not to be seen again.